Back on November 9, 2007 I had an exchange of emails (below) with Jim Robinson checking in with # 273. I answered his email, prepared a webpage, then (uncharacteristically, I hope) forgot about her. So, in December, 2008, as I prepared this page for her and tried to save it I got that "famous" message 'This file already exists - do I wish to overwrite it?'!!. Aquila did not get up on our online website Roster, just rested in our offline website database. Apologies to her. Here is Jim's December 4, 2008 email with a picture and some history. Spectacular spot for Dolphin work!! 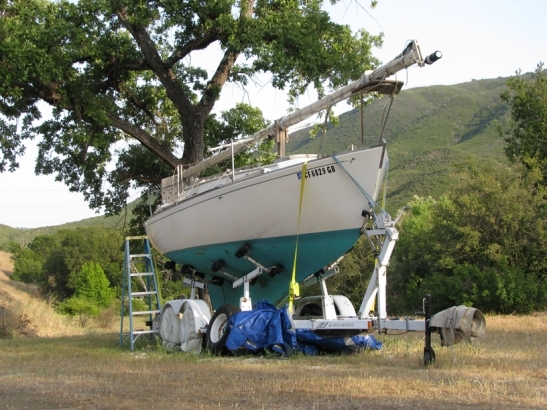 "The picture of the boat was taken in Tassajara Canyon just off Highway 101, a bit north of San Luis Obispo. Actually there were four homes on 32 acres (family compound) destroyed by a wild fire in 94' and the property was not redeveloped. I keep Aguila and an RV there, an open air type workshop, and ,oh yeah, a very large fire extinguisher"
I was surprised and excited to see the Dolphin site. I've admired Dolphins for over 30 years and found one of my own in 2003 (Hull 273, built 1978). I wanted to thank and commend you for this great site. I've visited Jim Huxford's site often and will always appreciate his work. Today I put in one of my periodic searches under Pacific Dolphin 24 and your site came up. Wow. I would like to send specs and photos on my Dolphin to share with others. Is there any particular protocol for adding material (photo's) to your site, or software method, etc or is it just forwarded to you? I'm beginning a major haul out / refit; taking on a worn rudder shaft, blisters like the pox, and probably dropping the swing keel. I'm going to be brimming with questions for site members. I fully support your efforts, the concept of an association, and I would definitely welcome a forum. If I can be of assistance, please let me know. I promply answered Jim with the following email. The red highlights is to draw your attention to a scary but successful (for me) effort to repair a worn rudder tube. I have just realized Jim was talking about a worn shaft, not a worn tube. Thanks for checking in, and for your nice comments about the site. You can start by telling me where you are, the name of your boat, your hailing port/sailing area and any history you have about the boat - like former names and owners/sailing area. Any restoration projects, interesting cruising/racing stuff that might make interesting reading for Dolphin peope. As you cruise through the site you will find a broad range of stuff that people send in. There are a lot of twists and turns in the site - you might get lost! 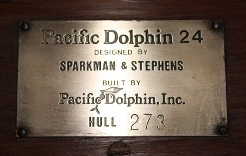 We need info about the builder Pacific Dolphin. Pictures in jpg. work well but I think I can handle most of the common software. You will find that there is a link to the Forum that is gradually becoming more useful. "I ended up having a new rudder built by Finco in Newport Beach. It was not cheap but it is beautiful and I can carry it around in one hand . Might compensate for that 9.9 four stroke weighing down the stern. I can send you pictures of the work, parts, etc., if that would be on interest to the site"
I've participated in the forums a few times over the past year. You requested the information on my boat awhile back and I'm sending along a summary for your editing. The second owner brought her north and moored her in Port San Luis or Avila, Ca. in the mid 80's. 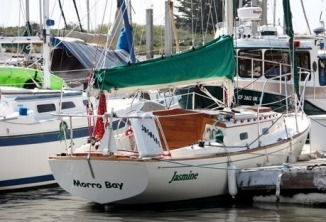 He sailed her off the central California coast then berthing her in Morro Bay in 2001-2002 and put her up for sale. 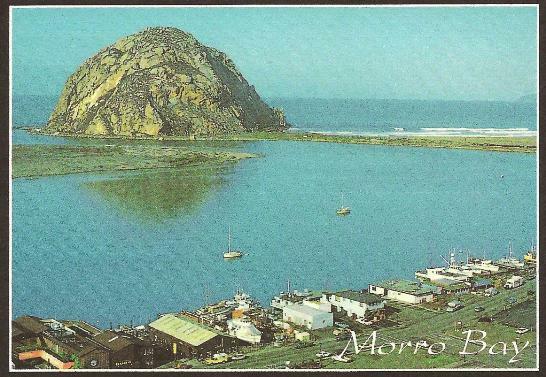 In the same follow up email, Jim helps us out with the locally famous seamark at Morro Bay "Morro Bay is where that really big rock that obstructs the view to the west. It also creates some wild "wrap-around" williwaws when sailing in or out of the bay. I tell tourists it's really artificial, a mock up built for a Cecil B De Mille film in the 20's and just left behind. 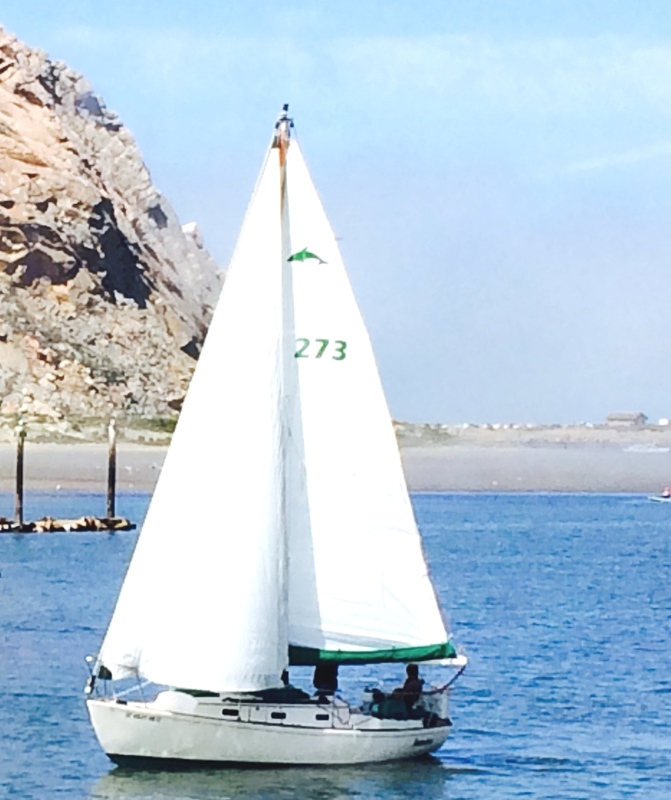 "Ohhhh", they say and drive on to Hearst Castle"
I bought her in 2003, sailing her out of Morro Bay for past 4 years. She is currently on a trailer and undergoing a refit. Jim sent in a detailed email describing his mast raising system which appears in full in our Technical Section on this subject. Click here to go there. January 16, 2010 Aquila has a new rudder! its weighs only about 25 lbs, 45lbs less than the old one! The full text of Jim's report appears in full in our Technical Section. Click here to go there. I have a Yamaha 9.9 long shaft (27 inch) high thrust 4 stroke. It's an electric start with a cable control unit to the cockpit. It replaced a Mercury 9.9 long shaft 2 stroke (1980 model) without controls. I sail out of Morro Bay, Ca., which is subject to impressive currents (5 knots, or more, at times) through the entrance and the extra horsepower verges on a necessity. The biggest issue I encountered in switching motors had to do with the inboard motor well. I had considered a Honda 9.9 but it was too large. I had to do some grinding to fit the Yamaha into the well. The four stroke engine tended to run hot within the well (hatch down) so I added fans at both in and out ventilation cowls. The fans are actually louder than the Yamaha with the hatch down. I have been asked more then once if I'm running an "electric" motor. The motor is very smooth, fuel efficient, and the longer shaft works well in Pacific swells. It does weigh 109 pounds (old motor was about 70 pounds) and I was concerned about how it effected the boats balance. I didn't notice any appreciable change. I use the boom and mainsheet to hoist the motor in and out of the well for annual maintenance. I'll take some pictures of the motor in the well and send them along. January 20, 2010. 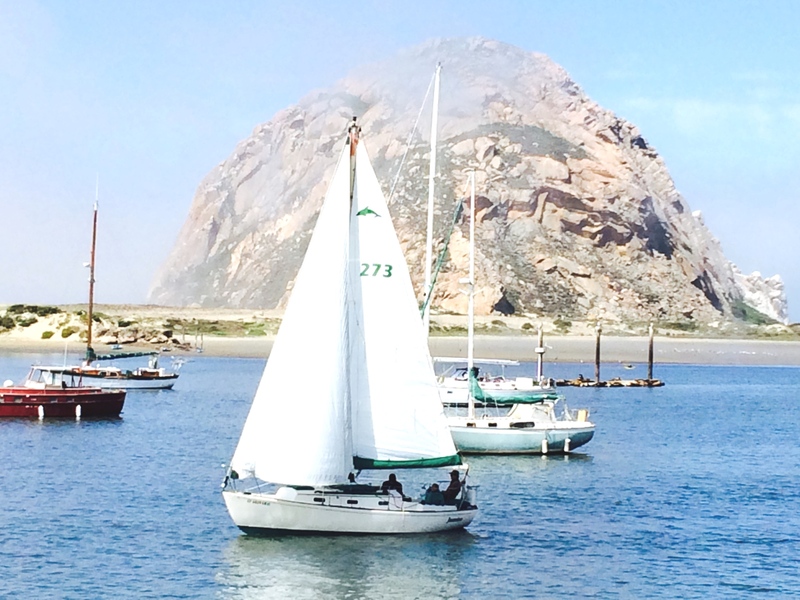 Morro Bay. Its a special place that your webmaster once spent a few hours. Searching for something totally unrelated I came across this postcard in my files that may not say it all, but must come close. January 26, 2010 Well, the picture did not say it all. 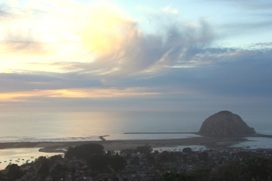 Jim thought we ought we should see the harbor entrance to Morro Bay on a normal day at left, and below on a bad day when they close it. The bad day picture was taken on January 22, 2010 - 2 days after the high surf came through. Jim also sent in some additional comments aspiration and his Yamaha 9.9hp. They are in the Technical Section/Outboard Motors. Click here to go there. February 5, 2010. Jim updated his comments on his Yamaha 9.9hp and its aspiration. 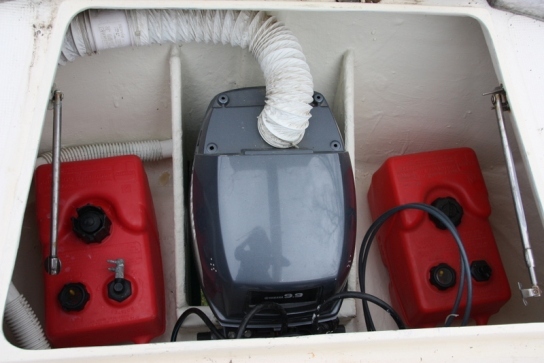 They appear below and in the Technical Section/Outboard Motors. 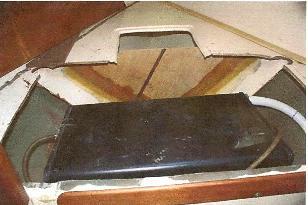 Here's a picture of the cooling system I mentioned on my Dolphin. This is how I keep my Yamaha four stroke 9.9 cool with the hatch down on the transom. The ducting pictured is attached to a deck cowl on the left. That "plastic band" in the duct in the upper left of the photo is a 12 volt blower/fan bringing air in. I have a " low loop" in the duct (unseen on left, under the deck) to trap water or moisture and drain through a small hole. I removed the intake cover on the motor and secured the duct to the existing port into the engine. Not pictured, but on the right is another blower/fan connected to another deck cowl which draws air out of the transom. I concocted this system after repeated issues with an "oxygen starved" outboard. The Yamaha has an alternator so the fans are essentially powered by the motor. Synergy! It was probably over kill but I drilled a half dozen small holes into the forward part of the engine cover to facilitate the air exchange. I've had the motor in the boat over 3 years (2 of those in the water) and I have no corrosion issues under the engine cover. You can see that the motor was a tight fit into the transom. Those are shift and throttle control cables in lower right which lead to cockpit. 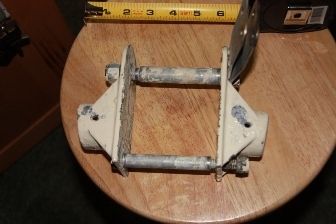 February 15, 2010 Jim is letting us know of a problem with his spreaders brackets on the Forum. Please post any ideas, comments there. If any solutions develop we will convert this to an article on the Technical Section. Here is his email (minor edits) and photos. These are the factory Pacific Dolphin Spreaders, cast aluminium and the picture above right is my problem. An internet search finds SS replacements at Dywers but in a very different attachment configuration. I'm going to check out re- fabricatingor "mending" the broken piece, but I suspect it would will be difficult to expensive. Those shims over the bolts are seized as well, so I may break more of the set up before if I need to seperate the pieces. Worked fine the first 32 years. March 1, 2010 Jim checked in with an interesting 'fix' on scratched. cloudy plastic windows. We will also post this in our Technical Section/Repairs. I'm in Yosemite doing my camp host gig. Being here gives me time to weed through my hard drive for long lost files and I found these pictures I took over a year ago of a window reclamation project on my Dolphin. The windows are Plexiglas and badly oxidized and /or sun damaged over the years. I had already decided to replace them and I thought I would experiment with and old friend, Barkeepers Friend (a light abrasive powder) found at Wal-Mart and a new found friend, Mequires PlastX (cleanser/polisher for plastic headlight covers) found at Kragens or Auto Zone. Between them I was pleasantly surprised at the results. One picture captures the outcome of the combined application. Suffice to say I did not replace the windows and a year later they are still clear. May 17, 2010 Jim send in the following update (minor edits) on projects he has going with Aquila. I've attached a couple of small projects completed on my Dolphin and one picture of hull to deck per a request you made. 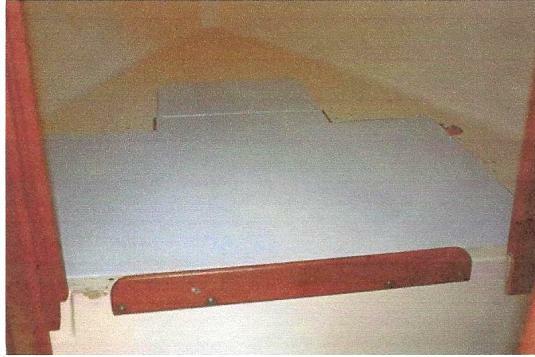 I've had new canvas built for the hatches, handrails and wheel steering, but the interesting piece is the cradle sail cover still being built. I really liked the Doyle version on the charter boats I've sailed in the Caribbean, and after years of procrastination I bit the bullet and I'm having one built. It incorporates lazy jacks and a top side zipper. Ain't cheap, but for a single handler like me, it will rapidly pay dividends. Or at least that's my rationale (and I'm sticking to it). 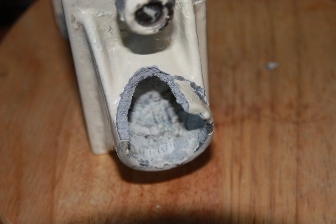 Small caustic drips over thirty years can have serious side effects. Replacing those plastic battery boxes every ten years and simple battery maintenance would have gone a long way. (Note to self; rinse this area out on a regular basis). 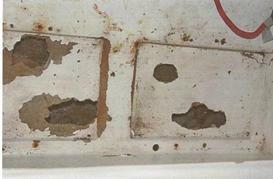 I had placed some plywood pieces between these eroded insets and replaced the battery boxes since I bought the boat in 03. Not a remedy for the long term remedy, indeed. Did some awkward grinding and fiberglassed in ¼ inch plywood floors for the insets.Lots of fiber (mat) in this diet. West System epoxy – only way to go. Next: through bolted pad-eyes for strapping. 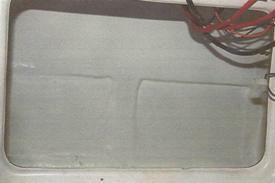 The previous owner had replaced the water tank and holding tank in the forepeak. He gained the needed access by cutting out a large section of the liner as seen above. He covered the cutout (and entire forepeak) with ¾ inch ply. I wanted to stiffen the boat and install something a bit more complete looking yet removable for access to the hull area. I reinforced the edges of the cut with 2X3 redwood pieces, then overlayed with redwood planks, screwed in and easily removable and covered with marine ¾ ply, set with screws. This is the finished project. 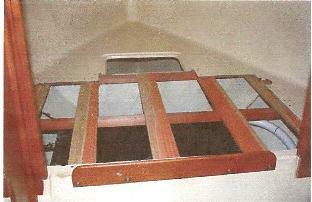 Next: Install a vent panel beneath the teak coaming. December 26, 2010. Jim sent in the following update and pictures. I'm nearing the completion of a refit (spanning some 2 years) on my Pacific Dolphin that included a rechristening. Aguila is now Jasmine. Topsides and hull finished with PoliGlow. My plan is to have her back in the water by New Years, but alas it has rained a bit here, and it looks like the impeller needs replacement on the Yamaha. I might just make it. I do have rain gear, after all. Webmaster note: After getting over one's envy of that lustrous topside finish please notice that Jasmine has a wheel! I uploaded some pictures of Jasmine to a Picaso Album - see links below. 1) Epifanes varnish requires patience and prep but I'm very satisfied with the results. The 8 coats on the hatches / handrails are over a year old. Of course, the secret is to cover them with canvas, eh. 2) I have applied Poli-Glow to three boats over the last year (the last being Jasmine) and it really brings a "new" gelcoat look to the hull and topsides without grinding or buffing. I'll keep you posted on the durability as I revisit my "test" boats over the year. 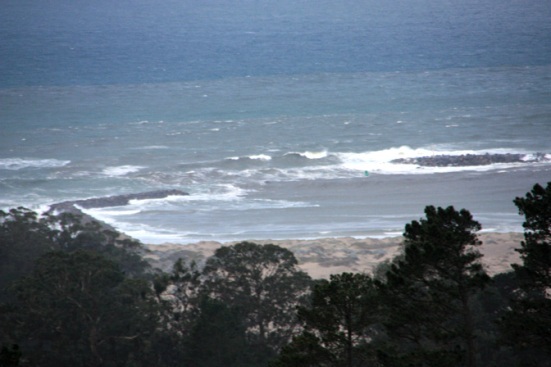 I've also included some pictures of our local "Tsunami" experience in Morro Bay. I was on Jasmine when the first wave came through and really didn't see it as I was too busy hugging my binnacle while the elevator went up and soon after, down. By the time I got my camera out we were on wave number three and that's where my photos start. This is a Tsumami slide show I put together for family / friends. These are assorted photo of the tidal surge and subsequent damage, many in the slide show. 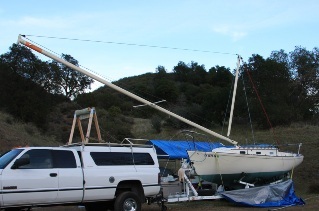 I have some new pictures of Jasmine sailing, and with her new mainsail and cradle sail cover. We added these last two pictures to our page on Covers in the Technical Section. Click here to go there. June 21, 2012. 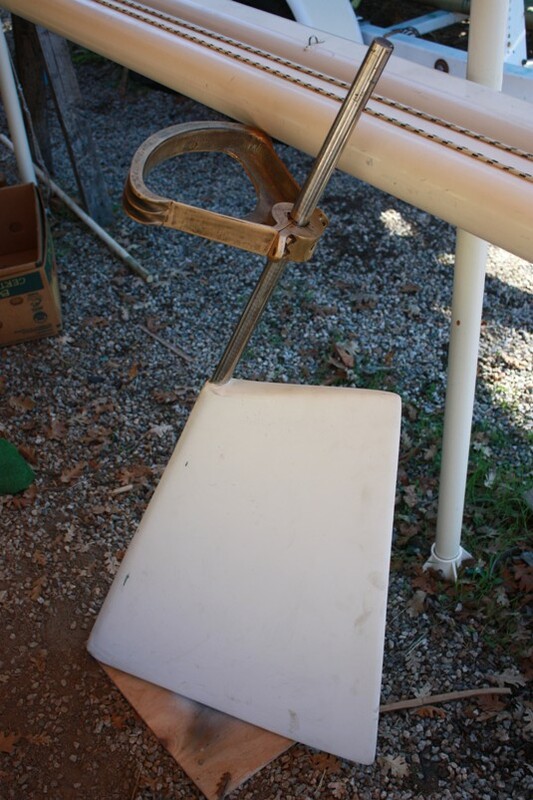 Jim responded to a follow up question on his rudder replacement project, and gave us a quick update. Details of the new rudder project are included in the Technical Section/Rudders. Click here to go there. The new rudder is working great. I believe the light weight (fiberglass over polyurethene foam core versus solid fiberglass) offsets the added weight of 104 pound 9.9 4 stroke Yamaha in the well. The boat definitely feels more balanced. A new main sail may have a hand in that as well. I pulled Jasmine this week as I'm off across country for the next three months, so further sailing performance reports will have to wait till September. I did notice the Poliglow hull coating was holding well. Still shiney. Fender rubbing be damned! Good to hear from you. I’ve been pretty busy over the past year and Jasmine has suffered for it. She is still slipped at Morro Bay State Marina, and Beluga (Yankee #143) is still about 200 yards away in her slip. I’ve seen no one aboard over the past year. I’ve had the motor out of Jasmine for annual (actually 18 months) maintenance which became protracted when I discovered the aluminum prop desiccated by electrolysis while the upper shift rod broke off (bound at the upper, lower shaft connecting nut) during disassembly. I decided to try a Solas Amiga 4 blade prop but after a couple weeks of emails with their tech support the prop just would fit properly. It would appear the Yamaha 9.9 Power Thrust model has a different prop shaft length then standard Yamaha 9.9’s and the Amiga prop would bind when tightened. No thrust washers adaptions are available, nor could I live with a makeshift “shim” affair, so it was back to a OEM Yamaha 3 blade replacement. I was somewhat surprised to find the new prop was made ofplastic/nylon. Takes care of the electrolysis issue, just wondering how it will stand up to impacts. The shift rod required a bit of upper case disassembly to replace but it was all mechanical and straight forward, so I’m back in business. Shakedown sail last week went well in 4 foot seas and 12 knots of wind. The Grey Whales are returning north and there are frequent sightings of Killer Whales and False Killers close offshore. Spouts galore. I was paddle surfing about 3 weeks ago when a group of dolphins cruised though on either side of me. Thats a normal encounter, but the big flat grey head with barnacles startled me. A juvenile Grey (about 18 feet) had joined their group. So I naturally fell of my board. Hope I do better with Great White encounters. I’ll send photos as events might occur. I hope all is well with you. As always the Dolphin site is great to follow. Great job, Ron! March 29, 2015 David Le Mestre, (Davarsa) a long way from his home in Brittany, France, was in Morro Bay recently and got these pictures of Jasmine.